Since moving to State College, Pennsylvania, I've been taking many butterfly photos. So this is my attempt to be somewhat organized in terms of listing butterfly pages. Following the butterfly list is a short list of some photogenic moths. 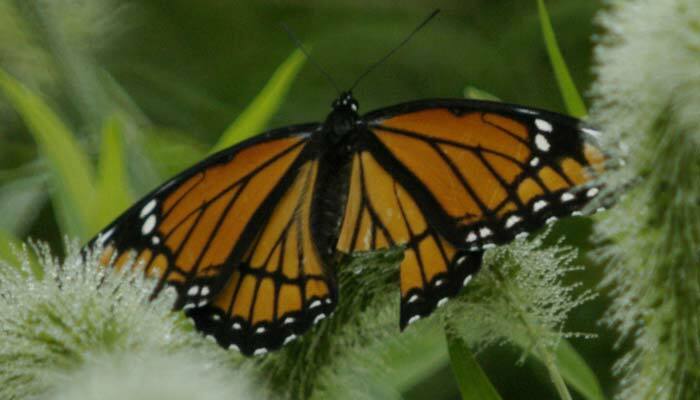 The viceroy is identical to a monarch except the viceroy (a) is somewhat smaller and (b) has an additional black line parallel to the hindwing. For the lack of a better system, the following pages are alphabetical order. For general butterfly interest, I've a page showing 4 species that arrived within 15 minutes of each other in my backyard 0n 5 August 2016). Other organization choices for my list include color and Latin names. It may come to that one of these days. Photography note: The photo above was taken with a Pentax *ist D and the SMC 1000mm reflex lens.